Students who dress their best put their best efforts into learning! We will expect all students to adhere to the uniform policy while at school. Students not complying with the uniform policy will be asked to call home for a change of clothes. Belts are to be solid black, brown or navy. Jewelry items are to be minimized. No oversized/dangling jewelry is to be worn. Solid red sweaters/ sweatshirts, or those with the ACM insignia, are allowed to be worn with the uniform. All other jackets, sweaters, etc must be left in students’ lockers during school hours. Pants/shorts must be cotton slacks. Denim, corduroy, and sweatpants will not be permitted. An ACM Spirit T-shirt, worn with uniform pants/shorts/skirts, is appropriate on Fridays only. The uniform items for girls consist of the ACM plaid jumpers and/or navy pants/skirts/shorts. Girls (K-3) may wear jumpers in a dark navy and green plaid that has red and yellow stripes in it, with a white cotton button front shirt. 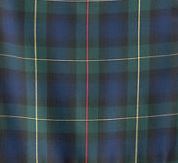 Girls (4-6) may wear skirts/skorts in a dark navy and green plaid that has red and yellow stripes in it, with a white cotton button front shirt. Girls (K-6) may wear dark navy pants/skirts/shorts with a red short or long sleeved polo shirt or red turtleneck shirt. A red cardigan completes the look. All girls’ skirts/skorts or shorts must be 3 inches above the knee or longer. Blouses and shirts must be worn tucked in at all times. Belts are to be worn with any shirts/pants that have belt loops. Shoes must be mostly navy, white, or black low style with solid rubber bottoms. Boots are not permitted at any time. Shoelaces must be solid white, black or navy. Socks must be solid navy, white, black or red. Tights must be solid white, navy or red. The uniform items for boys consist of dark navy pants or shorts, a short or long sleeved polo shirt, or a red turtle neck. Boys may also wear a short or long sleeved, light blue button down oxford shirt with navy pants/shorts. A red cardigan completes the look. Pants should be altered to fit in both length and waist. Baggy pants, or those worn below the natural waist, are not appropriate. Belts are to be worn with any pants or shorts that have belt loops. Shirts are to be worn tucked in at all times. Socks must be solid navy, white or black. The Arapaho Classical Magnet uniforms can be purchased from Land’s End, Target, Walmart, JCPenney, Sears, Academy Sports & Outdoors, or the Back-to-School Extravaganza.